Daily Dzynmkr: They grow up so fast! Yesterday, I took a trip to Lowe's to buy bigger planters for my peppers. 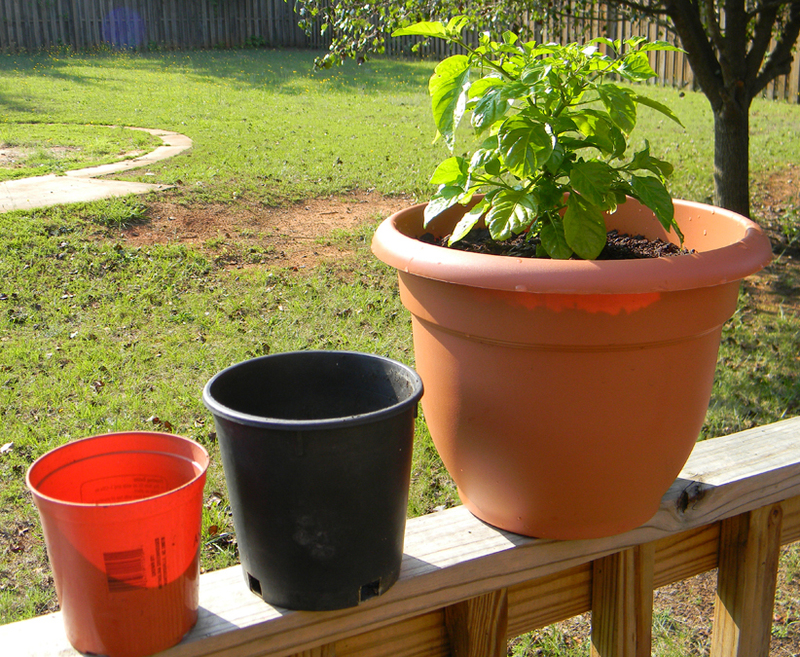 With all the recent hot "summer" days, the peppers were filling their black pots and asking for a new residence. I wish I would have taken a photo of these peppers when I received them in the mail. Just tiny seedlings looking for a good home. I would like to think I've provided them with that and more. (They started out in the smallest orange planter, then moved to black, and on to the biggest). If it sounds like I think of my plants as babies - you would be right. I love to see their evolution. A new leaf here, a branch there - nothing escapes my watchful eye. 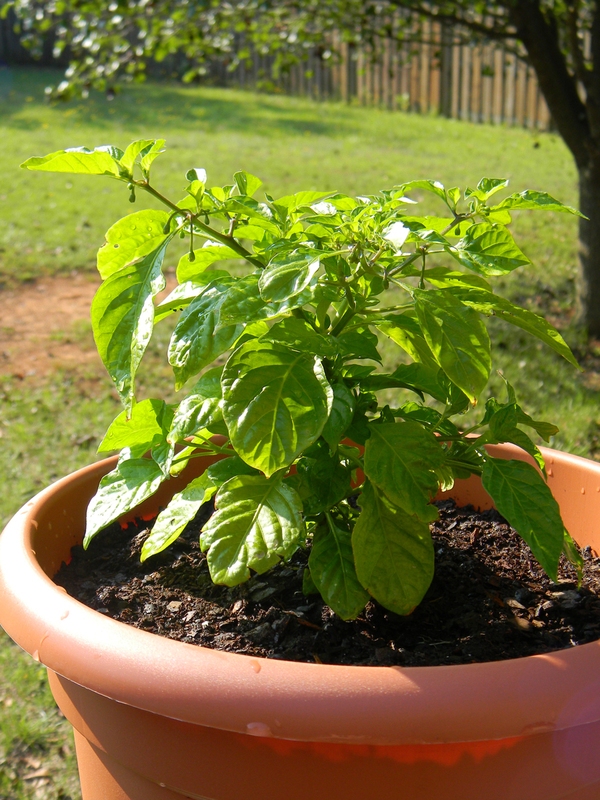 And while it sounds ridiculous to some, I find absolute pleasure in contributing to a plant's growth. Would it happen without my help? Sometimes yes, sometimes no...but I feel like I've made my mark on the world. Eventually, they will die out for the season and I'll return to my longing for Spring to return. But while they are here, I will enjoy the precious moments I've been given - to nurture and care for them. The biggest of the two plants getting adjusted to its new home. 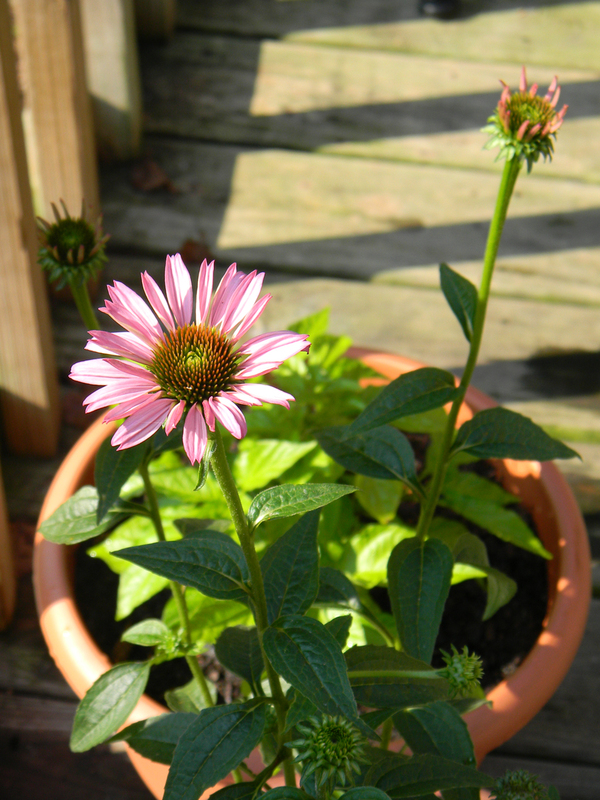 My echinacea plant (coneflower) has its first fully opened bloom now. Before I go, I want to share a couple of things I found on the web about this subject. Both made good points, so I couldn't list just one. (The titles link to the pages I found them on). Enjoy! I wrote my last newspaper column about what I have learned from my garden. The lessons were simple: You can't control weeds any more than you can control other people or everything that happens to you and that even with the best planning, gardens, like life, have a habit of going their own way. I also pointed out that a garden is the best place I know to restore yourself. It was interesting to me how many people learned a great deal from their gardens. One person said he learned how to care for others by caring for his garden. Another said it wasn't the weeds in his garden that bothered him; it was the weeds that grew from his neighbor's garden into his. A third person said he had running battles with creatures who wanted to burrow their way into his garden and pull plants out by their roots--a little like having bad neighbors, he said. These comments and others helped me to see how much of our wisdom comes from the natural world. We learn about growing and nurturing and even dying from the world in which we live. Nature is an equal opportunity teacher if we respect her. Martin Luther, the reformer, was asked what he would do if he knew the world was going to end. His response? "Plant a garden." Imagine you’ve been given a garden. It’s you’re garden, and your responsible for its care. You decide what grows in it. You decide what it looks like. And you get to partake of the fruit that comes from it. Like any garden, it’s gonna be prone to sprout weeds. Undesirable seeds will occasionally be blown in, and you won’t know it until they sprout. But you get to decide how long those weeds stay. How tall they get. But be careful, because left untended, weeds have a way of taking over. we look at our garden and see nothing but weeds. In these times, it’s easy to curse the garden we’ve been given. It’s also easy to look at the weeds in our garden, and think that it’s too late, or that this is how it was meant to be, and that there’s nothing we can do about it, at least not now. When you look at your garden and see only weeds, it’s hard to forget that it’s still a garden. The weeds do not define it. They are merely the visible evidence of what you’ve allowed to grow there. Until next time! Happy Gardening and take care of those weeds!